Now starting search engine optimization (SEO) of my series “SEO chain tutorial” of 10 episodes of the series.this series episodes are designed in such a way that the new and the old all will be benefited from this. Domain name or domain information. Link popularity or site back links. Web site visitor or the amount of traffic. Here it turns out that search engine optimization is 100% of 23.87% of domain name information. If you think about search engine optimization domain name or how important the correct information. So, first you must pay attention to SEO to your domain name. SEO should be about you going to do with the subject that matches your domain name. If your site is the name of the song and download then if it is music.com so you do not need to SEO. In search engine optimization, back links is works as like “Building Foundation”. 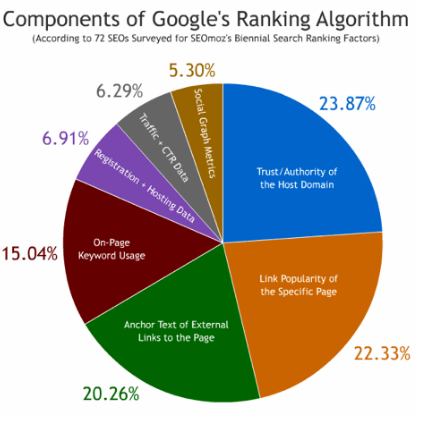 Evidence is 100% of the SEO back links or link 22.33% popularity have occupied space. So there is no reason to throw back links While SEO. Keep it in mind to SEO. When we give the site a link to a link in the text of the reserve. After downloading the software, it can be such a link as click here to Download or Download Software etc. Anchor link back to the text, there is a similarity. When you give your link somewhere on your link as soon as you can anchor text. These will be discussed in detail later on. It takes 15.04% out of 100%. But not so poor. So the keywords used in search engine optimization plays a role. So if you get a good result, you will need to use the right keywords. The fact that we do not take seriously. But 6.91% in SEO is important. It is the registration and hosting of data in the possession of this web site. So you’re trying to do as much as possible for the good web site domain or hosting. Such as godaddy.com site is good. All the rest are excluded 11.59%. There’s web site visitor or the amount of traffic, social web site popularity etc. This site analyzing is from seomoz.com. They do not update here websites load spread. and another thing is page rank. Here we do not mention this because this is the combination of above two back link & anchor text.